Wherever there is saturation/distortion, you can blend in compression, with a musical, compatible result. As far as the principles of fx placement, compression goes into the same category as distortion, with respect to time-fx. So, put time fx after saturation or distortion or compression. For example, suppose you have an echo with fading repeats. Play a note briefly. Putting a compressor after than would result in nonlinear fading of the echos, with extreme compression, no fading of the echoes at all. (It would be an interesting but artificial-sounding special effect, a form of ducking, when you play more notes.) If you do post-amp compression, time fx should generally go after that, really late in the chain -- just like the natural architectural echoes from playing a rig in a giant arena. Compression is often used *after* a miked, blasting guitar speaker. A lot of engineers used tape compression. Now with digital recording, tape compression simulation is available. Headphones and monitor (listen to both, for reference, while adjusting settings). The only really good sound I got out of a solid-state Peavey Backstage Plus was with the amp cranked, with an eq and compressor placed before the amp's input. Suppose you use power tube saturation with no preamp distortion. Sustain will be a major concern; notes will distort heavily for a very short time, then become clean too quickly. You could use a plain level boost, but that would just mean quick change from *very* saturated to *moderately* saturated as the note quickly fades. You could use an overdrive pedal, but it outputs some preamp distortion grit, which we are trying to completely avoid here. Using a compressor, we can keep the signal level, which is hitting the power tubes, at a constant level, even as the note fades away. Listening to a compressor directly, you will say that it's unmusical, stiff, artificial, choked. But when placed before a tube power amp, the amp's sweet tone completely converts the compressor sound into sweet-spot power-tube tone. You are using the compressor to hold the power tube at a constant degree of saturation, a constant level of saturation, while the note decreases. This is how the compressor can actually keep you in the sweet zone almost all the time and help bring out the power tube ideal sweetness during a larger percentage of the note's lifetime. It helps the amp dwell in the sweet zone. The Dan Armstrong Orange Squeezer is a highly regarded miniature compressor. The most interesting compressor I've heard of is the Peavey VC/L-2 Valve Compressor with EL84; see my page on that. "Compression Sustainer - The CS-3 compresses high-input signals while boosting low-input signals, giving you smooth sustain without degrading the quality of the original sound. A range of effects from gentle compression to squeezed sounds is at your command. 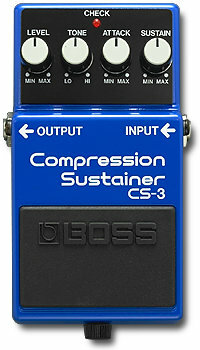 Designed for outstanding low-noise performance, the CS-3 also provides EQ for precise sonic control. For a mellow sound:This setting is ideal for solos in ballads or mellow songs. Add a chorus effect for even more depth. For chord work:This setting balances the volume of each string for smooth chord accompaniment. For thick, rich sounds: Add Chorus and Delay after the Sustain effect. This setting is good when playing sustaining chords."